The Dell Venue 8 7000 Series is the thinnest tablet PC in the world that comes with the thickness of only 6mm. It has a display panel of 1600 x 2560, a pixel density of 359 ppi and the functions of the multi-touch and light sensor are built in this product. 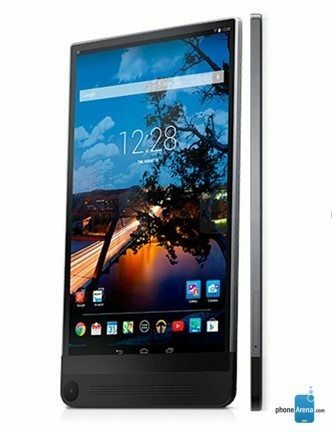 The camera is 8M and 2M for the use of selfi mode with the system chip of Intel Atom and the processor of Quad core. The OLED panel is expected to be the one that is produced by the Samsung Display as it has the same resolution with the panel employed for the tablet PC Galaxy Tab S SM-T700 that the Samsung Electronics has released. As the sales of the LG Electronics 55-inch Curved OLED TV (Model: 55EC9300) exceeds over 1,000 units since it became available at the end of last September, it is leading the era of OLED TV popularization. LG Electronics released the curved OLED TV at KRW 3.99 million which is 1/4 of the price of the product launched early last year at KRW 15 million. The sales amount has increased drastically more than 20 times as the price becomes affordable due to the improvement of panel yielding rate. According to the LG Electronics, the customers who used to hesitate to purchase the OLED TV because of the high price are coming back making increased inquiries. The LG’s 55-inch Curved OLED TV realized the ultra slim thickness of 4.9mm as it does not need a backlight. Though it is a curved TV, there is little color distortion changing according to the viewing angle, providing more precise color and deeper picture quality than general LCD TV even in the various genres of viewing environments including drama, sports, movie, documentary, etc. Samsung Electronics announced the performance presentation for 3Q held on the 30th of October. IM (mobile) division recorded KRW 24.580 trillion, a quarter-on-quarter decrease of 14% and the business profit was KRW 1.75 trillion, a quarter-on-quarter decrease of 60%. The 3Q business profits of IM showed the largest drop compared to the previous quarter since 2012, and it was the first time falling under KRW 2 trillion. It is due to fierce growth of Chinese electronic companies and a month delayed announcement of Galaxy Note 4 than the previous model, having little influence on the performance of 3Q. Robert Yi, chief of the firm’s investor relations team said, “We failed to quickly respond to the market flow of smartphones which is changing its focus towards price competition.” In view of that, Kim Hyun-joon, a senior executive at its mobile division, said “We will increase the profitability as actively response to the low and middle priced market” and the competitiveness will be reinforced as differentiating display and materials, and improving camera, AP system, etc. Samsung Electronics unveiled the Galaxy A series targeting the low and middle priced market, on the 31st, only a day after unveiling the strategy regarding the low and middle priced market. With full metal body design, ‘Galaxy A5’ and ‘Galaxy A3’ are the slimmest Galaxy smartphones to the thickness of 6.7mm and 6.9mm respectively. Furthermore, Galaxy A5 and A3 is equipped with the 5-inch and 4.5-inch correspondingly, and front camera of diverse selfie functions and the very first five million pixels, targeting young consumers who are the most frequent selfie mode users. The price range is expected to be about 400 – 500 million won, and it will begin to release in November at the selected countries including China. There is much attention towards whether Samsung Electronics will bring about good results with the full metal bodied Galaxy A series at the heart of China’s enormous price competitiveness. LG Electronics presented a variety of products from TV to smartphone and smart watch at the Korea Electronics Show held from 14th to 17th October. The most prominent products among others were the OLED TV and newly released G Watch R. With five 77-inch UHD curved OLED TVs exhibited in panoramic array, the entry way attracted much attention from the visitors and at the exit, there was the G Watch R presented with the round display which represents the internal display of G Watch R. The LG Electronics’ view on the OLED was evidently demonstrated at the booth specifically designed the entrance and exit with OLED applied products. One difference that the LG Electronics revealed at the Korea Electronics Show is no other than the attitude regarding the LG OLED TV. Though numerous OLED TVs were exhibited at the IFA 2014, Germany in September, LG Electronics had somewhat passive approach as putting the phrase “The Future of TV” under every explanation of the OLED TV. 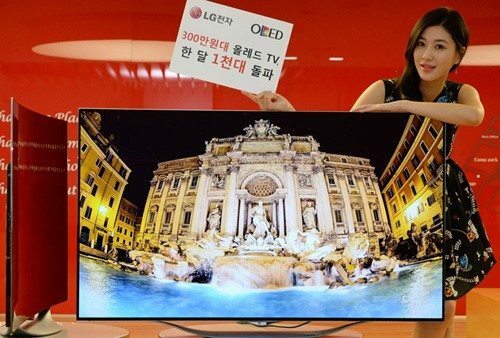 However, after a month later at the Korea Electronics Show, the change was apparent toward more active way by arranging the large phrase of “Now, it is OLED age for TV” on the upper area of the booth with the 77-inch UHD curved OLED TVs. There’s a lot to be done for LG Displays to expand the age of OLED TV. As LG Display marked on the photo above for itself, the curved UHD TV will be another task to be tackled. It is anticipated to see the LG Display’s next movement until the “The Age of OLED for TV” after crossing mountains on its way. LG Chem. continues its intense marketing activities for the OLED lighting. The OLED lighting panels were applied inside the Hanoak (traditional Korean house), remodeled with the IVAAIU City Planning last August, and the butterflied shaped lightings applying 240 OLED lighting panels were supplied to the caf? called Marley coffee in Itaewon. 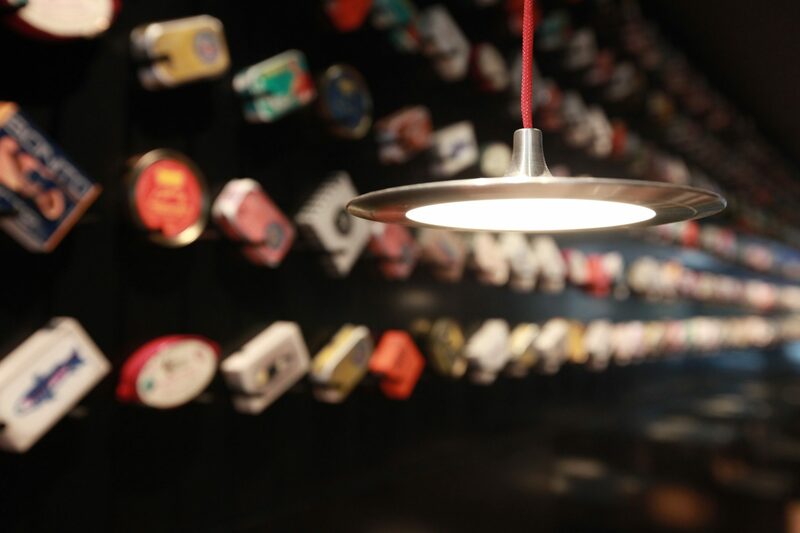 And the circular type OLED lighting panels were used to decorate Tincan, a newly opened pop-up restaurant in London in last September. The OLED light used as the light source at Tincan was the Φ100 OLED Light panel (N6OA30) that the LG Chem. introduced early this year for the first time. The efficacy of the panel is 60lm/W, a high CRI is over 90, and the lifetime is 40,000 hours (LT70) at 3,000 cd/m2, with only 1mm in thickness. The Lamp was designed by the architectural design firm AL_A using 3D printing. LG Chem. is leading the OLED lighting panel business most actively as making the announcement last September for the release of the OLED lighting panel in November which will be equivalent to a LED lighting with the efficacy of 100lm/W and the lifetime of 40,000, and it has secured various lighting companies like Acuity and Zumtobel as a client. OLED TV, still the TV of the future? Total eight companies announced the OLED TVs at the IFA 2014. The size ranged from 55-inch to 77-inch and six among those eight companies exhibited UHD resolution OLED TV. What these eight companies are implying through exhibiting the OLED TV is that it is the Future TV. Revealing the three UHD OLED TVs using LG Display’s 65inch UHD panel, Panasonic set off that it is the Next-Generation TV Technology and the Chinese company Changhong presented 55-inch and 65-inch Curved OLED TVs in the Changhong @ Future Display zone. For the First in World Innovation Technology Zone demonstrating the future of the company, Samsung showed OLED TV with the phrase ‘Curved OLED TV’, underlining the word ‘Curved’ not ‘OLED’ and this indicates the company’s focus in other direction,Curved LED TV. As the leading company of the OLED TV market, LG outdid the OLED TV exhibition with total 11 products of OLED TV from FHD to UHD Curved, and variables in different sizes. But LG also shared that the OLED TV is ‘The Future of TV’. It is contrasted against that OLED TV took more than 50% of the entire booth at IFA 2014 and the active involvement implemented to take over the OLED TV market. Then what is the current TV for LG? Why the future of a TV should be the OLED TV? First of all, it is due to the pricewise. The LCD TV of the same size and resolution is sold for the half price and even the consumers recognize no distinctive differences for purchasing the LCD TV. 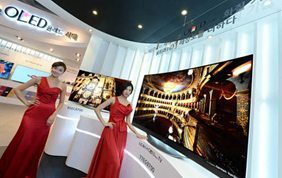 Majority of the companies exhibited the OLED TV have manufactured the product using panels provided by the LG Display which is in the course of making constant efforts to open a full-scale OLED TV market. And numerous companies in related business expect LG to open a market for OLED. 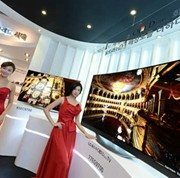 It is anticipated to see how LG the different TV maker will form the OLED TV market in the future. http://jpn.olednet.com/wp-content/uploads/2015/01/140912_OLED-TV-아직까지-미래의-TV인가.jpg 727 1379 OLEDNET http://jpn.olednet.com/wp-content/uploads/2015/09/logo_oled.png OLEDNET2014-10-03 18:50:312015-02-02 18:54:50OLED TV, still the TV of the future? As Apple announces the Apple watch on the 9th (local time), the battle of a smart watch began for electronic companies including Samsung, LG, Apple, Sony, Motorola, and even ASUS. With the Samsung’s smart watch the Galaxy Gear, most of the products are released in the form similar to a square type display electric watch. In particular, when it comes to customer’s willingness to purchase a smart watch, the design is a critical element for it requires features for both electric device and fashion item at the same time. Reflecting the comments that the design is rather crude, Samsung and LG adopted a new smart watch design. The Galaxy Gear of Samsung expanded the panel in 2-inch, acquiring visibility and adjusted to appropriately fit on a wrist. LG presented G Watch R with the round shape different from previous square types. The most recently unveiled Apple watch took the design of existing square form but highlighted a sense of softness as the surface curves toward the edges. These all three products employed the flexible OLED which is thin and bendable, and enables different designs more than the glass type LCD as the cutting process is easily modifiable. Furthermore, the display qualities like the color resolution and power efficiency issues were already verified from the success of the Galaxy series which were equipped with the AMOLED panel. The fact that Samsung, LG, and Apple chose to use the flexible OLED must be noted. From this detail, it is expected that there might be another trend in the OLED market as smart watches – though it is only three products for now- take the flexible OLED when the sales of AMOLED panel for mobiles are decreasing at present. http://jpn.olednet.com/wp-content/uploads/2015/01/140912_Smart-Watch는-OLED다.jpg 327 878 OLEDNET http://jpn.olednet.com/wp-content/uploads/2015/09/logo_oled.png OLEDNET2014-09-12 14:07:222015-02-03 14:09:48OLED for Smart Watch! LG unveiled the smart watch LG G Watch R and 77-inch 4K OLED TV at the IFA. Equipped with the 1.3-inch round display using the advantages of the plastic OLED, the LG G Watch R with the round plastic OLED (flexible OLED), distinguished itself from existing smart watches of a square screen resulting from the properties of display. Furthermore, its design approach has improved from the assumed notion of typical crude smart watch shape, presenting the all new circular display which is by no means inferior to conventional analog watches. One of the critical issues regarding a smart watch is battery life. While an analog watch requires battery replacement once in a year or even 2-3 years, the smart watch needs to be charged at least once or twice a day minimum. So the screen turns off whenever it is not in use. LG enhanced the battery capacity from300mAh to 410mAh, emphasizing that it is a smart watch available all day by providing it with the Always On function that never turns off the screen to check time like an analog watch. Unlike the Tizen, another smart watch for Galaxy Gear with AMOLED, it is installed with the Android Wear OS. With the voice control function of Google, it lets you search, message, and email. The 4K OLED TV exhibited at the LG booth was total ten products with one 55-inch 4K, three 65-inch 4K, one variable 77-inch and six Curved OLED TV. LG touted the OLED TV with three concepts titled Life like color, True black, and Self-lighting pixel. Providing lifelike and true to form experiences with videos magnifying the high contrast ratio, the 77inch 4K flexible OLED TV is the largest 4K OLED TV at present. More than 50% of LG booth was comprised of the G watch S and OLED TV, demonstrating the scope of OLED business in the present and also the future of LG. Samsung Unpacked Event Episode 2 was held in three countries of Belin, Beijing and New York simultaneously on September 3. With a high anticipation of the world, the Galaxy Note 4, Note Edge, the Gear S, and Gear VR were revealed. Compared to the Galaxy Note 3, the Galaxy Note 4 has improved in its resolution, S Pen function, and camera and battery performances. The resolution has been enhanced from FHD to QHD and the resulting increase of battery power consumption issue was resolved through the advancement of battery performance and power consumption. Though there were not much to pay attention in terms of specifications, what stood out was the sense of careful consideration of users in the Galaxy Note 4’s. One among those is the battery charging time. Most of the people spend a substantial amount of time using smartphones in daily life. Therefore, the battery charging time is as important as the battery capacity. And the Galaxy Note 4 has decreased the time for charging 50% from 55 to 30 minutes. Another improvement was a camera software which is the most frequently used function of a smartphone. Assuming that the use of front camera is as common as the back one, the self-camera function was upgraded, featuring 3.7 megapixel resolution, the maximum aperture of F1.9 allowing vivid photographing, 120 degree self-camera function and a function of taking pictures by tapping the HR Sensor. Samsung has been announced the Galaxy related accessories from the Galaxy S5. For this time with the Galaxy Note 4, the luxurious image was emphasized by releasing products like battery covers created in collaboration with the high-end brands such as Swalovski and Monblac. One more product is the Galaxy Note Edge, characterized with a display that curves over right side enabling the information check not only on the front display but also on the side screen. It is possible to see push notifications and launch applications even when the smartphone cover is closed. 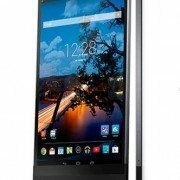 In addition, the entire front display can be used as a photographing screen and the side screen removes any distraction from any notifications while surfing the internet or watching videos. Galaxy Note 4 will be on sale worldwide sequentially starting this October. The future market response is expected to see how the Samsung’s meticulous concern for users presented in the Galaxy Note 4 will be delivered to the customers. LG Electronics unveiled the Ultra OLED TV on August 25 at the Conrad Hotel in Yoido where Ha Hyun-hwoi, president of Home Entertainment (HE) and Choi Sang-gyu, head of Korea sales and marketing at LG Electronics were in attendance. “The Ultra OLED TV is an epitome of TV technology combining the best display and resolution,” the president Ha Hyun-Hwoi said, adding that “The future OLED TV market will be expanded, leading the display technologies.” Regarding the curved surface of OLED competitive with LCD, he explained “The priority is given to the resolution of a TV” and “There is no distortion of color or change of picture quality in the curved surface of the OLED TV”. Saying that “OLED TV will play a role of a game changer replacing the LCD within 2-3 years with various merits like color reproduction rate, contrast range, viewing angle, etc.” he also emphasized “The next generation of TV market trend will led by the state-of-the-art premium Ultra OLED TV in existence”. The LG Ultra OLED TV provides the most lifelike graphic picture quality with ultra HD resolution of its unique WRGB technology and 33 million sub-pixels. For the characteristics of the self-lighting pixels, the indefinite contrast rate is allowed, reproducing perfect black color. With rapid response speed, it also reproduces natural image without any afterimages. This product is also equipped with a sound quality which is appropriate for the flawless picture quality. Designed with the world-renowned professional audio company Harman, it delivers balanced wide-range sound quality of exhilarating effects with multi-channel ultra surround technology. In addition, the sense of immersion and the aesthetic effect were maximized for the innovative design approaches of ultra slim curved screen and leaf-shaped stand. Due to its own attribute, there is no distortion or change of color in OLED TV watching from every direction. 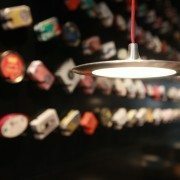 It can be installed on the wall depending on the surrounding environment and preferences. Loaded with innovative web OS, this product offers significant values more than the existing smart TV. The web-based smart TV is recognized as a new strong point of TV platform of reorganizing the smart TV market by the ‘simple usability’ through ▲simple transition ▲simple search ▲simple connection which is the essence of a TV. LG Electronics plans to lead the next generation TV market by securing medium-and long-term growth momentum through OLED TV. And through the continuous innovation in manufacturing technology, R&D, and investment on marketing, the OLED TV era is to be advanced and the OLED TV will be the new growth engine for display industries through the expansion of ecosystem. Established the OLED TV manufacturing line in major cities over the world from the last year, LG Electronics will release the Ultra OLED TV at the beginning next month in North America, Europe, etc. sequentially. LG Electronics will take pre-orders for 65-inch Ultra OLED TV (Model: 65EC9700) from the 26th to 29th of next month at the LG Electronics distributors nationwide. 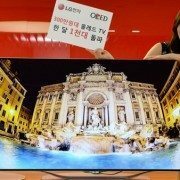 The 65-inch Ultra OLED TV will be sold at a price of 12,000,000 won through the cashback benefit. The delivery starts from the end of September. And LG will consolidate the lineup of the Ultra OLED TV as releasing 77-inch (Model: 77EG9700) model in the fourth quarter.